March 2, 2019 SHF St Vincent de Paul celebrated 55 years at SHF. The Society of St. Vincent De Paul is the world’s largest social assistance organization. 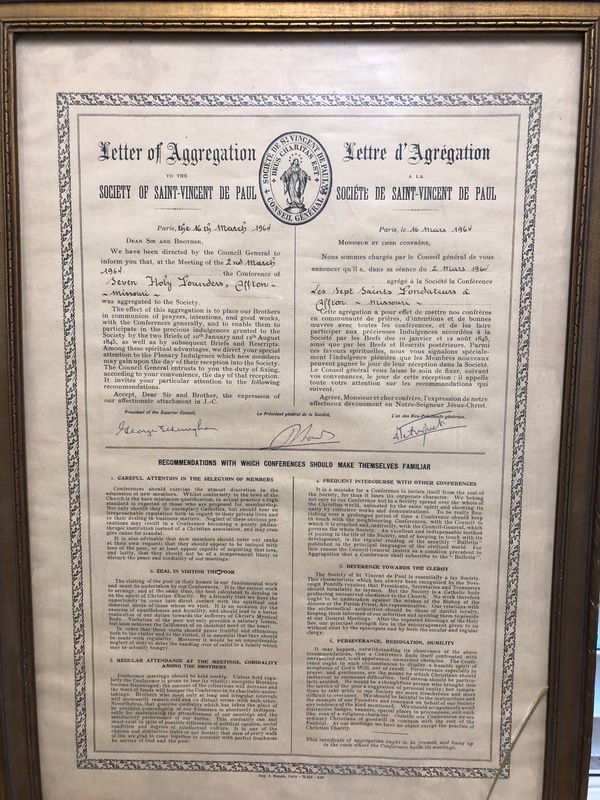 The Seven Holy Founder’s conference has been aggregated (a part of it) since March 2, 1964.
and families with food, utility payments and rents. Additionally, our two parish cook-in teams with the financial support of the SVDP, feed over 400 people a month at the soup kitchen at St. Vincent De Paul Parish downtown. We also provide clothing and home furnishings to our Neighbors in Need in our parish through our Thrift Stores Voucher program. Our support of the Affton Christian Food Pantry, both financially and with food donations, assists residents (our neighbors) in the 63123 zip code. We are most thankful for all the prayers and novenas that are offered daily for the success of this Vincentian organization. This 55th anniversary could only take place because of YOU, the very generous parishioners of Seven Holy Founders who are inspired by the Gospel values as we grow in faith and concern for those who seek help and sustainment. A very blessed and prayerful thank you to each and every one of our parishioners. The St. Vincent De Paul Society of Seven Holy Founders. Generous Donations Make the Work of the St. Vincent de Paul Society Possible. Small kitchen appliances, utensils, pots, pans, silverware, bowls, containers etc. Clean usable shirts, pants, coats, shoes, dresses, blouses. Bedding items such as blankets, sheets, pillows. * Drop them in the blue collection bin at the lower level church entrance across from the parish hall and parish center. * Leave them at any of the other church entrance ways. * Drop them off at the rectory office during business hours. 314-631-8248 and leave a message to arrange a time to drop off your items. 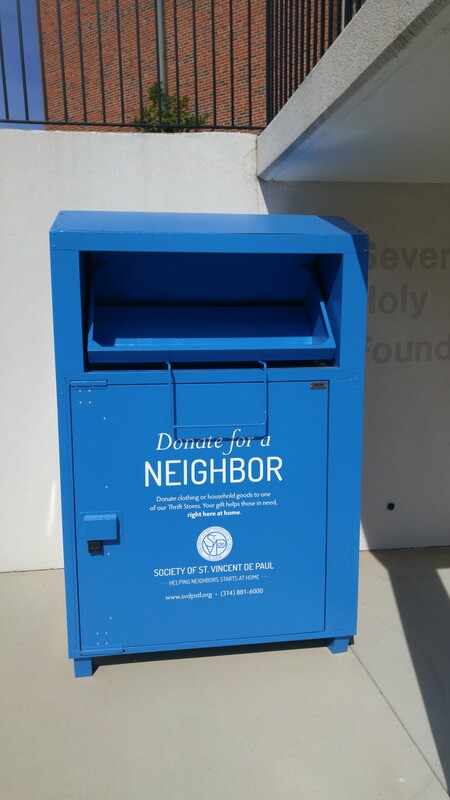 PLEASE REMEMBER: This drop box is only for donations of clothing and small household goods. Please, do not place food donations in this box; we continue to accept and appreciate donations of canned goods and other non-perishable foods to be left in church. ALSO: PLEASE DO NOT LEAVE ANYTHING OUTSIDE OF THE BOX. You can help continue to support ACFP (Affton Christian Food Pantry). On Saturday, April 27, 2019, the ACFP is hosting “Pianos for the Pantry”. This is a dueling piano night of entertainment and fun right here in the SHF Parish Hall (see details below). Lastly, we are in need of donations for the event. 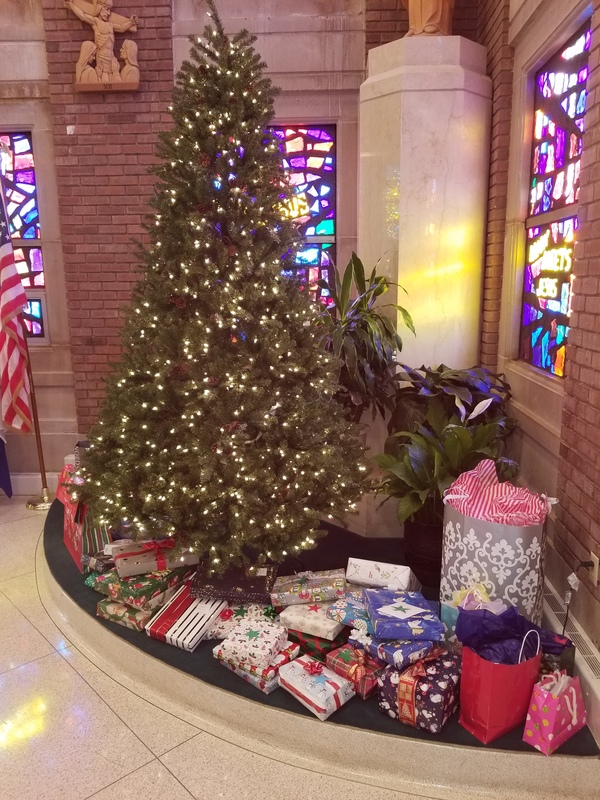 If you have gift cards, cash, or other items we can use in silent auction baskets, please put them in an envelope marked Food Pantry and drop them at the rectory. If you have questions or would like to help out, please contact Melanie Fechter at 314-283-5719. Thank You!!! great for high protein, meat, fish, stew, chili, ravioli, tina canned hams etc. We need your help. Our parish is a kind and loving parish and I think if everyone knew the situation the bins would fill rather quickly. Can you help us fill the shelves? God bless our parishioners! These items can be brought to church throughout the year and placed in the vestibules. These food items will be picked up by members of SVDP. Canned goods can be dropped off at the rectory any day during business hours. Place cash or check in a plain envelope marked SVDP and drop it in the collection basket at any time. Make checks out to SHF SVDP. Cash or checks can also be placed in the slots/donation boxes near all of the church entrances that are marked St. Vincent De Paul. When a family member passes away, memorial contributions can be made to SHF SVDP. SHF SVDP has 2 cook-in teams that help prepare meals at St. Vincent DePaul Parish. If you are interested in helping out on either of these teams please call the SHF SVDP hotline (314-631-8248) and leave your name and phone number and a brief message. 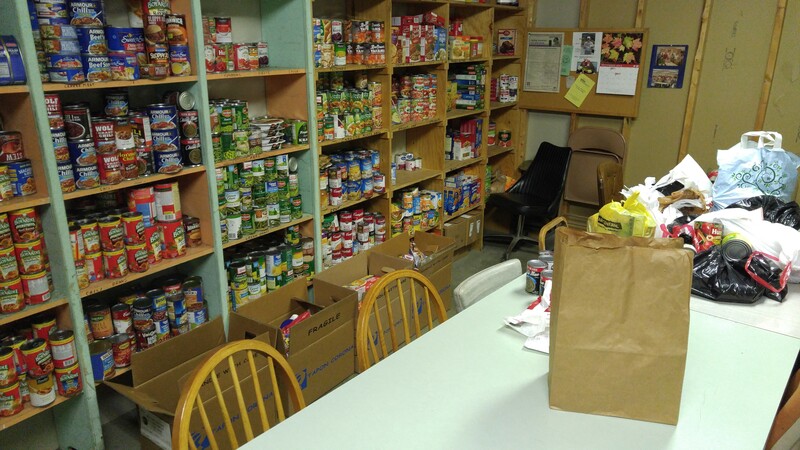 If you would like to volunteer during the week, the Affton Christian Food Pantry is looking for help. Contact the Food Pantry at 314-580-3138 and ask for Anna. Transportation can be a huge problem for the working poor. Find information for donating a car on the webside for svdpstlouis. Pick up can be arranged for large furniture and household items. For more information check out the SVDP website Or schedule a pick up by calling 314-881-6006. All items must be on the first floor for pick-up. The Society now operates seven Thrift Stores in the Metro area. 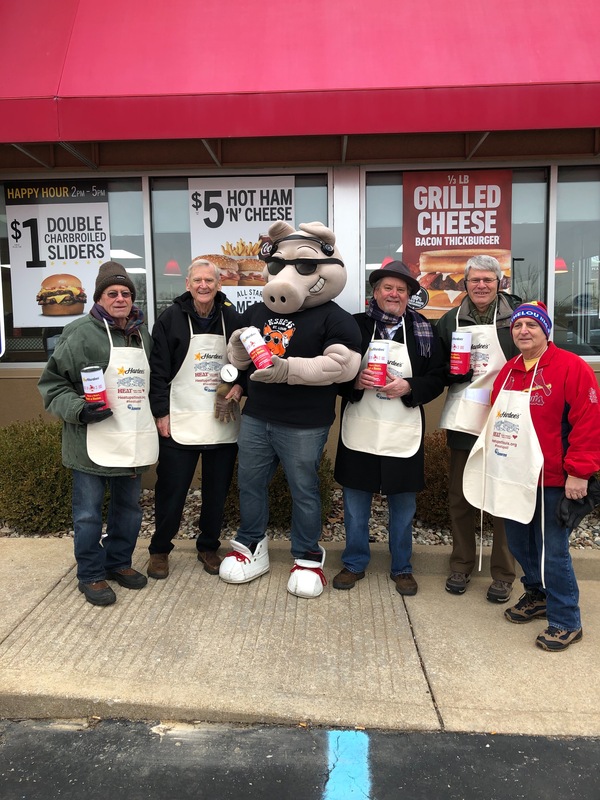 SHF Vincentians at Rise and Shine Heat up St. Louis, February 15th 2019.